But, the great banking crisis of 2008 is over. It began last September 15 when Lehman Brothers filed for bankruptcy and bottomed when Citigroup (C) traded below $1 last month. Most analysts believe that mortgage-backed securities which included packages of subprime home loans failed when mortgage default rates went up and housing prices raced down. That is only partially true. Banks made a tremendous series of ill-advised loans to private equity firms, hedge funds, commercial real estate holders, and the average man with a credit card balance which he cannot pay. Wells Fargo (WFC) indicated that it made about $3 billion in the first quarter of the year and declared its buyout of the deeply troubled Wachovia to be a success. Wells Fargo (WFC) said that the low cost of money from the government combined with a surging demand for mortgages was all the medicine that it required. The Mortgage Bankers Association said its seasonally adjusted index of mortgage applications, which includes both purchase and refinance loans, increased 32.2% to 1,159.4 for the week ended March 20. Refinancing accounted for 78.5% of all applications. Now, putting just these two data points together, one would hazard a guess that a stabilization of home prices is not what this points to. What about housing inventory and also the prices of homes given the current conditions? You can get the data from the National Association of Realtors Statistics: Existing Home Sales and Sales prices of Existing Homes. The inventory (in terms of months of supply of existing homes) is unchanged from 1 year ago and as we enter the season for home sales, we shall have to see how it goes. However, what should be noted from the two tables above is that for virtually unchanged supply of homes, the average home prices have decreased 15.5% nationally. 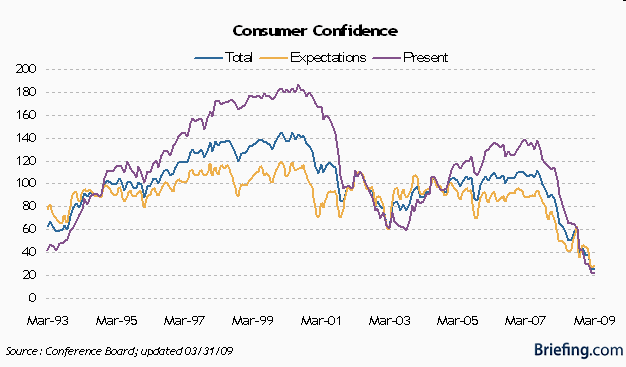 So what belies this sort of optimism? But Ian MacIntyre is talking about the crisis and not whether the residential real estate is about to improve. But what if this is but a temporary floor which soon gives way – wouldn’t the banks be back in the doghouse then? On a side note, perhaps, the best indicator of the fact (some time in the future) that the housing market has stabilized will be an onslaught of “How to get rich through foreclosures” schemes. I’m not trying to be funny here but honey to be had does bring bees. So what does this have to do with the supply chain for crying out loud? 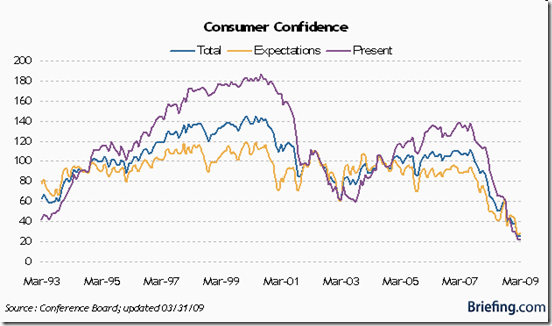 Take a look at the consumer confidence which is at the lowest level since it was instituted as a measure. The road to recovery looks like a long and winding one.